Who has gone abroad with their smartphone for holiday or on business, only to realise that you have forgotten to activate your preferred date roaming plan and there is no free WiFi around? I have. During our Australia trip in 2009, we self-drove and I had relied on maps - those hard-copy, paper ones - to get to our destinations. And we got lost during one of the days. Faced with the prospect of fast-disappearing daylight, I turned on the 3G (yes, still 3G back then) on my phone and sought help from the maps app. We finally did found our way before night fell, but it came with a hefty price. But truth is, we can never do without data connection when overseas nowadays. Because we still need to stay connected with loved ones back home, in case of emergencies that crop up or to receive updates from our family members... or pet hamsters. Because Google maps is our best travel companion and we need its help to get around in a foreign land so that we do not get lost (again). Because sometimes the wifey may head off somewhere to shop, and we need to remain contactable. Because we may need to harness the power of the world wide web to do impromptu searches, like going off the beaten track. Because we need to Facebook and Instagram our #OOTD. All legit reasons to have a solid data connection while travelling, I reckon. But as my past experience showed, having international roaming data at your fingertips is all about preparation. Because a little preparation goes a long way in ensuring that you get to SAVE MORE on data roaming costs... which translates to having MORE to spend on your travels. Does your phone alert you instantly when you have new mail, new updates or new everything? All of these consume data so before you depart, set your mail and other app settings to manually “fetch” rather than “push” mail to you. In addition, disable all automatic downloads and app updates. You do not want your child's Clash Royale game to update automatically while walking down the streets of Taipei. Of course, the ideal situation when overseas is do have free WiFi wherever we go. But we do not live in a perfect world because more often than not, we need our phone most while we are on the move, not while we are sitting still. Also, public WiFi networks are usually not encrypted and potential security issues may arise. For starters, the StarHub Mobile Prepaid SIM Card is a $15 Prepaid SIM card which means any amount of talktime or SMS that one uses will be restricted to its prepaid value... which also means there is NO bill shock! The SIM Card allows you to roam overseas at Singapore data rates. NO DATA ROAMNG charges. That's right, you can surf overseas with a 1GB data plan that costs just $5! All you have to do is to choose and activate one of the data plans available before leaving Singapore. 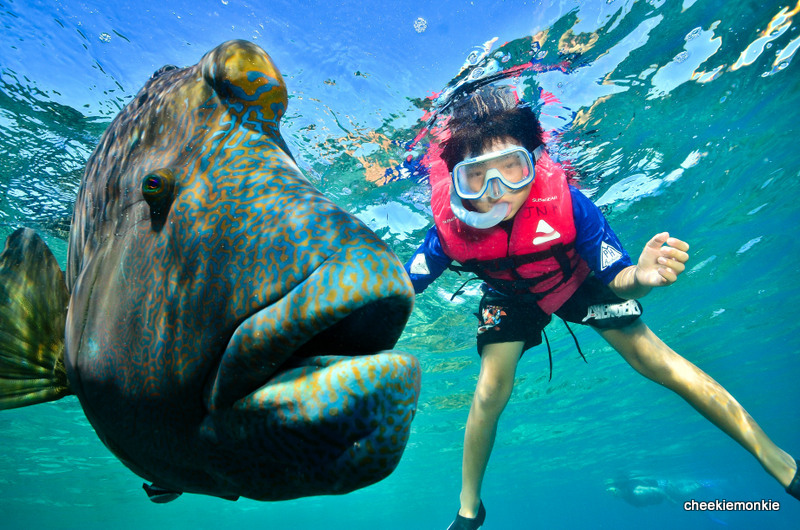 You can enjoy it in 8 destinations: Australia, Indonesia, Malaysia, US, UK, Thailand, Taiwan, Hong Kong. And what are the data plans, you ask? Whether it is $5 for 1GB worth of data over 3 days or $20 for 3.6GB worth of data over 30 days, the rates definitely look so much more attractive than the usual overseas data roaming charges that I am used to! All I need is to buy a StarHub Prepaid SIM and activate a data plan. And you know what more savings means, don't you? More shopping! In the eyes of the wifey, that is. Be sure to download the Happy Prepaid App on your mobile phone, the one app that you need for all your prepaid needs (available on both iOS and Android)! Use it to activate all your roaming settings, check data & credit balances, activate Data Plans and more. Frankly, the Happy Roam is all about convenience. Because one can use the same SIM Card and travel to all these 8 destinations! You just have to purchase a Prepaid SIM card in Singapore and activate it before you fly off. NO hassle. Get ready for everything right in Singapore! NO painful pre-trip research on the best telco rates overseas. NO need to waste time queuing at an overseas airport for a SIM card. NO astronomical rates to pay since the data rates are based on Singapore rates. Oh, and did I mention that one can even purchase the StarHub Mobile Prepaid SIM Card at the UOB Currency Exchange counters at Changi Airport's Departure Halls? How's that for convenience? So all you really need is one SIM card for a multi-city trip! All you have to do is to complete the following simple steps before your trip so that you can start surfing once you land! So whether it is sharing on Facebook and Instagram, or going off the beaten track with help from Google Maps, or staying connected with loved ones while travelling, you are assured with convenience and great value with StarHub's Happy Prepaid SIM Card! All there is left now to do is to work on my #OOTD poses. 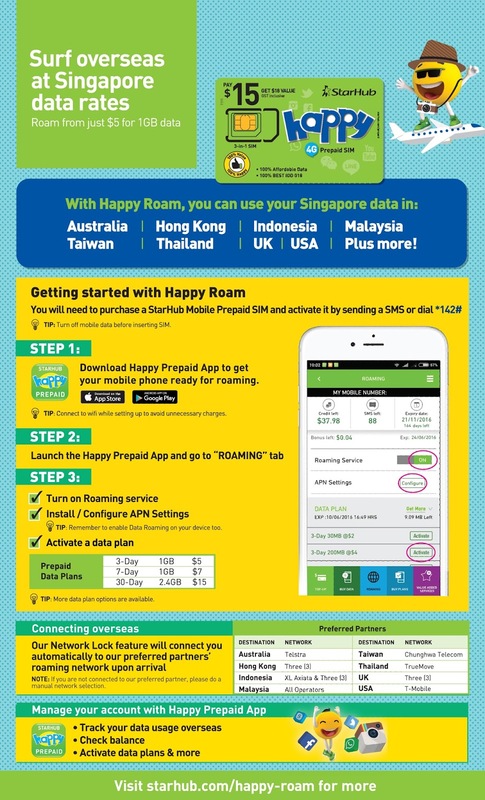 For more information, visit StarHub Happy Roam.